Those who want to reduce their carbon footprint after they die can plan a green funeral that is eco-friendly. More so now than ever before, people are becoming concerned with the impact that common funeral practices have on the planet. Burials take up valuable land, while cremations produce a lot of greenhouse gasses. But new practices such as green burials and chemical cremations can be expensive. So we’ve gathered together some easier and cost-effective tips to help you plan a funeral that’s a little more earth friendly! The clue is in the title – all of this requires planning before you pass. When coping with a loved one’s death, eco-friendliness will be low on most people’s list of priorities. If a green funeral is important to you, it makes sense to plan ahead. Communicate your needs and requests before you pass away with a funeral plan. This relieves the stress on those you leave behind and can save money too. Funeral planning allows you to lock in current rates and pay ahead of time. And it can help ensure that your passing won’t cost the earth in terms of eco-friendliness, too. No, not the colour green! 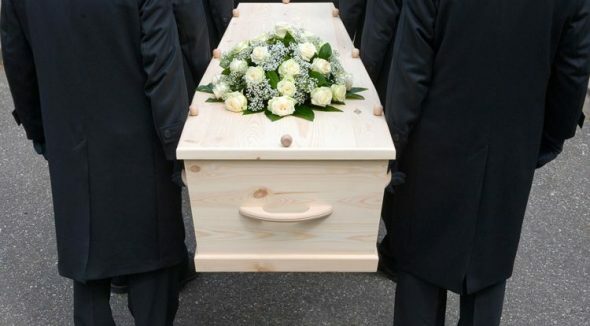 There are a number of eco-friendly casket options – made of bamboo, cardboard, or other biodegradable materials. The linings on these caskets are also made from unbleached natural cotton. Some coffins are even made out of recycled waste and FSC-certified wood, which reduces the effect on rainforests throughout the world. Green coffins won’t use chemical treatments or metals, which hinder the decomposition process once buried. Flowers are a common gift for the grieving at funerals. However, the eco-impact of cut flowers is more than you may think. Farmed flowers usually need to be imported to the UK and North America from warmer climates, incurring an environmental cost for transportation. Flowers grown locally can be worse, though, using artificial light and cooling to grow. Asking for donations instead will benefit a cause close to you or your family, and can save the planet a little bit too. Between orders of services and hymn sheets, a significant amount of paper can be used for a single funeral service. Opt for using recycled paper for an eco-friendly option that doesn’t use valuable resources from tree farming. When sending out funeral announcements, suggest that guests share lifts with those nearby, or use public transportation. It might even be possible to run a small bus for local friends and family. This won’t just make for a greener funeral, but also limit the risk of drink-driving after the wake. Eco Friendly Modular Furniture from Way Basics for True Green Living!